The demand for Hyaluronic Acid (HA) fillers, such as dermal fillers and lip injections, is rising each year. More and more people – particularly young adults – are seeking safe, effective facial treatments to enhance their features, and improve self-confidence. Facial fillers are injectable gels made of Hyaluronic Acid (a natural moisture-binding ingredient that helps keep skin plump and hydrated) that creates a natural ‘fullness’ to the lips and skin. Dermal and lip fillers are temporary treatments for wrinkles and thin lips, lasting several months before a top-up treatment is required. The natural aging process affects tissues in the face; collagen and cell production slows down, skin begins to lose elasticity, fine lines and wrinkles may also become apparent. Your face is your most precious asset, it’s the way the world sees you, and how you express yourself; the gel retains moisture, fills lines and wrinkles and adds subtle volume to replenish a more youthful look. We offer non-invasive anti-aging treatments – dermal fillers in essex – to smoothen, sculpt, and soften aging areas of the face. Anti-wrinkle fillers containing HA can be injected into forehead wrinkles, crows feet, nose to mouth lines, and mouth to chin lines. There are various brands out there that manufacture anti-aging facial fillers, we only use products from brands that have been FDA approved; Juvederm, Sculptra, and Radiesse. We use Juvederm Ultra to treat everything from fine lines to deep folds and wrinkles on the face. Juvederm Voluma is suitable cheek filler which is used to restore facial volume, add definition the cheekbones and jaw line, and gives a gentle lifting effect without the need for surgery. Juvederm fillers contain Lidocaine, a topical anaesthetic that numbs the treatment area as the injections are made for client comfort. Radiesse is another type of dermal filler used for skin rejuvenation. Radiesse fillers can be used to correct the signs of facial fat loss that comes with aging, restoring volume in deep folds such as Marionette lines and nasolabial folds. Sculptra Aesthetic injections help to correct and smooth facial wrinkles, and helps replace lost collagen in the skin. 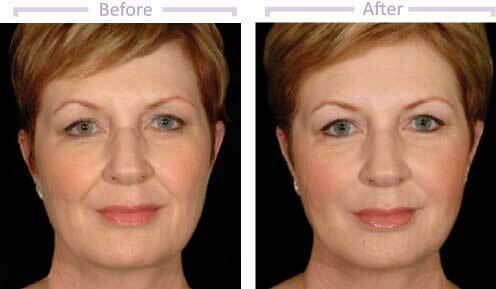 Dermal fillers provide an excellent, long term solution to an aging appearance. If your skin has lost volume and elasticity, anti-wrinkle fillers can help to treat the following problem areas, by restoring moisture to the skin, plumping and smoothing facial wrinkles, and giving an all-round lifted appearance. For more information – or to book a free consultation – call us on 01708 225555.